still enjoying my job—the sole source of travel funds for nine years and counting. my manager for approving my leaves and not rescinding it when there was an urgent project. my teammates for taking over while I was away. God for keeping me safe and in good health while on the road, especially those times I traveled solo. having the will to research, create itineraries, and book accommodations, despite being a procrastinator. enjoying my own company. Solo travel can be a bore to some people, but I find that I am okay with having myself as company. a body clock that's set to wake up really early—a great advantage especially when I wanted to arrive on or before wherever opened. My body clock also served me well when I had forgotten to revert my mobile from silent mode and I had to catch the early morning train to Busan. a travel buddy who would try any type of food even when he is already about to pop his shirt buttons. For our three days in Penang, I think we consumed food that's good for five days! travel buddies who are up for anything—food, cultural, historical, artsy, or even just aimless sightseeing trips. the boatman for taking us to another snorkeling area in Moalboal when the waves were too strong to go to Pescador Island and for the waves for, later on, calming down a teeny bit so we could go see the sardines. the habalhabal driver for expertly navigating the rollercoaster-ish road to Mt Hambubuyog in Ginatilan. finding Inambakan Falls in Ginatilan almost deserted. the jeepney driver who agreed to take us to Sirao Garden for only Php 50 per person. my officemate's father for trusting me to drive their car around Bohol. our odd–numbered group when we went to Abatan River for the firefly watching tour: it meant I partnered with the guide who did all the paddling. Haha! dolphins for showing up on our way to Balicasag Island. finding our way (after a few wrong turns!) to the top of Lanigid in Liloan. finally seeing the waterfalls of Samboan: Dau, Aguinid, and Hidden Falls. 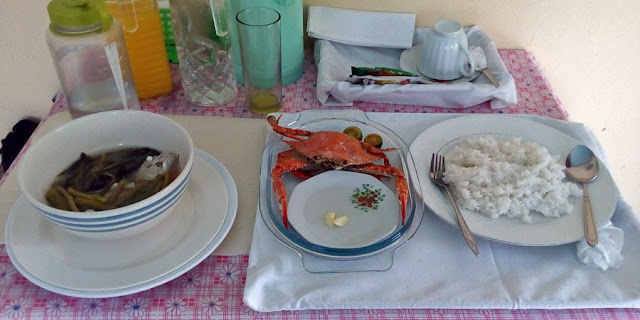 my aunt for preparing lunch for us when we visited her before going to Langub Beach in Sipalay. finding Langub Beach still as calm and as uncrowded as my first visit almost 9 years ago. a third (but first solo) visit to South Korea. This time to less touristy places. Kani of Kam Guesthouse in Seoul for waking up early to let me in after my very long flight delay. GaYeong for taking me to Jeongdong Oberservatory and Oh Hyang Jokbal, places I never would have discovered on my own. MinJun for treating me to Nanta! and gopchang dinner. GaEun for meeting while I was in Seoul. I hadn't seen her in four years! It was nice catching up with her over a bossam lunch. Yong for the tonkatsu dinner and for a night drive around Busan despite his busy schedule. Yong and JungIn for showing me around Nampo in Busan so late at night. Very cold night but very good times! Hyoja Bakery in Seoul for giving out free samples to waiting customers and their friendly staff for talking to me (the only foreigner in the long long line). the old lady in the bus for asking another lady to accompany me to Haeinsa Temple. Truly grateful as the way from the main road to the temple wasn't clearly marked. the lady who accompanied me to Haeinsa Temple who was very patient while I took my time walking uphill. finding my name in Masan in Changwon City. my two friendly Taiwanese roomies in Sum Guesthouse in Busan for inviting me to dinner (it was late and I still haven't had dinner and was very hungry!). Brennan, the blogger behind Baktin Corporation, for bugging me to join him to Dinagat Islands. my officemates for a fun Canso X hike. my good friend from highschool for taking me to the province of Rizal for a day of art and to Pampanga for a day of history. my friend's friend for acting as tour guide in Angono. Ma'am Julie Divinagracia of Divinagracia Cottages in Port Barton, San Vicente, Palawan for helping me find a group to join for the island hopping tour. Ma'am Myrna Laurente of Myrla's Garden and Cottages in San Vicente, Palawan for preparing delicious food (and not charging too much!) during the two days I stayed there and for contacting a tricycle to take me around San Vicente. the tricycle driver in San Vicente for charging so little a fee and not accepting anything more. the vans in Port Barton and San Vicente that include drop off and pick up services at no extra charge. the van driver from San Vicente to Port Barton for charging me just Php250, probably mistaking me for a local. I read in blogs that the fare is Php300. finally gathering enough people to go to South Sandbar. a memorable 9-day solo journey around the Kansai Region of Japan. finding myself in out of town and less touristy spots in Kansai. the staff at Koyasan Guesthouse Kokuu for giving me tips on what to see and where to eat in Koyasan. finding walking tours around Naramachi in Nara and Gion in Kyoto. the cheap laundry fee and the free hair dryer at Guesthouse Wind Villa in Kyoto—pretty useful when I had to dry my shoes and wash my clothes after a day out in the rain. the random oldies in Koyasan (Wakayama) and Ikaruga Town (Nara) who have stopped in their tracks or whatever it was they were doing or wherever it was they were going to to talk to me...in Japanese! finding Hiloki Hostel, a clean, new, and affordable hostel located near Nara Station, just a few weeks before the trip. the bus driver in Ikaruga Town (Nara) who, despite not knowing how to speak English, gave me directions on how to find the right bus. having a day to spend in Arashiyama. visiting one of my favorite spots in Kyoto again: Higashiyama. the will to get up and find dinner at Dotonbori after a long tiring day. 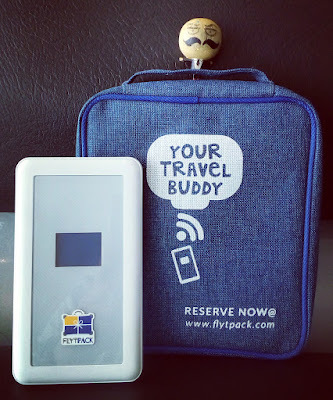 Flytpack for keeping me connected for the entire duration of my Kansai sojourn. a second visit to Bohol for the year (and before the year ended! )—this time to visit Puntaas and Pamilacan Island. the driver we hired to take us to Puntaas for not falling asleep on the road even if it clearly showed in his eyes that he seriously lacked sleep. the army truck driver for letting me hitch a ride from the pier to Cebu IT Park. all the readers of this blog. This time-consuming, unprofitable blog is still up and running (albeit slow) because of you! 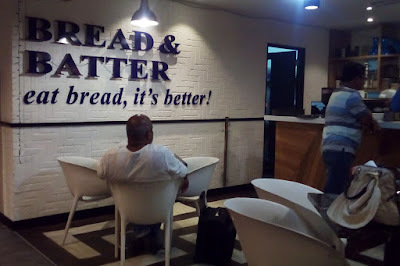 Bread and batter is their bread and butter. 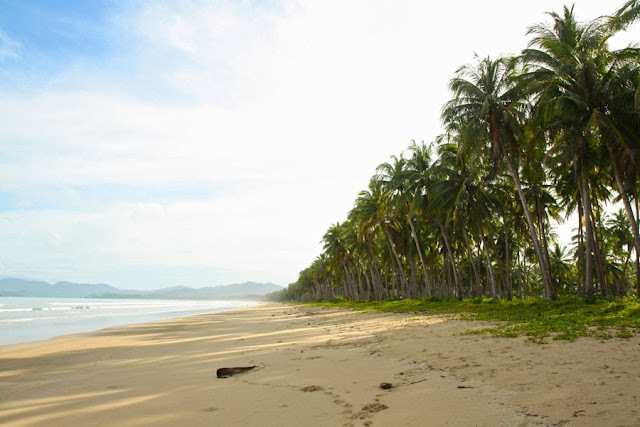 Long Beach, a 14.7–kilometer stretch of fine, cream colored sand, said to be the longest beach in the Philippines, was the only reason I went to the Poblacion of San Vicente in Palawan. Will these photos be reason enough for you, too? Savior - Sorry, I wasn't able to get the contact number and schedules for this company, but I added it here to let you know this is a third option! pumpboat – Php 1500 for up to 4 pax, 1 hour. Note: Long Beach can also be visited as part of an island hopping tour from Port Barton. Just negotiate with the boat operator for the price. Turublien's rooms are actually across the river. Because I was traveling alone on a tight budget, I did not stay in any of the above. Instead, I stayed at Myrla's Garden and Cottages [0939 906 4256], a short 5-minute walk to (about 500 meters from) Long Beach. The rooms and cottages surround a garden behind the owner's house. I had booked a single fan room for Php 450, but the owner, Ma'am Myrna Laurente, put me in a very big room with two queen size beds and a private toilet and shower. I am guessing this is the air conditioned family room (I did not use the A/C, of course). When I arrived around noon, I was surprised that Ma'am Myrna had prepared lunch for me even though I did not ask her to. I did not expect it to be free, of course, but she assured me she won't charge too much. I ended up having my every meal there, and she only charged me Php 100 to 150 per meal (with servings that were huge, I could never finish my meals). 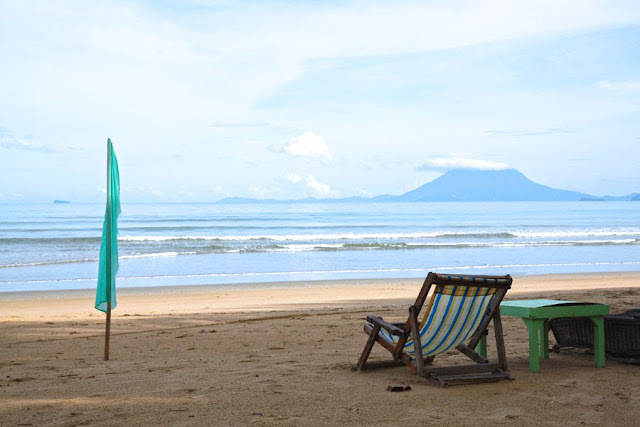 take very long walks – it is, after all, the longest beach in the Philippines! If you want to visit Long Beach while it's still uncrowded, the time is now. But if you can't take the long bus or van ride and the spartan amenities the current inns offer (except for the very expensive Agutaya Resort), please wait for the airport to open (probably sometime 2018) and the airlines to put up flights direct to San Vicente, and for new resorts to sprout along the beach (I have been told that many celebrities and investors have already bought Long Beach properties). Port Barton is a barangay in the municipality of San Vicente in Palawan. 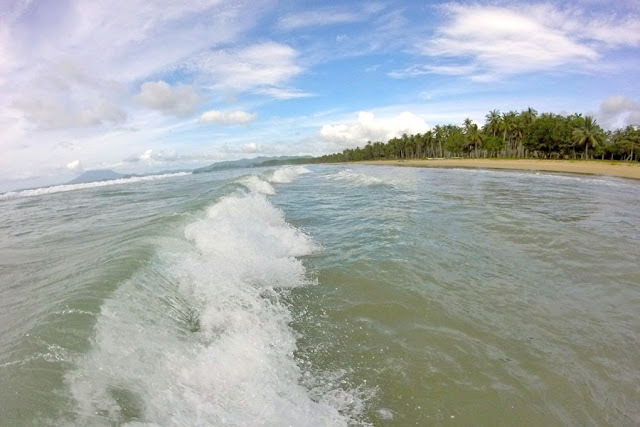 It is about 145 km northwest of Puerto Princesa. Fare is Php 250 and travel time is 3 hours. For some reason, foreigners are charged Php 350. And Recaro, when I called, said fare was Php 300 (Php 350 if picked up from airport). The shuttle vans will drop you off at your accommodation in Port Barton. Heads up! From Puerto Princesa to the turn off for Port Barton is smooth sailing, but from there on to Port Barton is a jiggly, wobbly, slippery, muddy (when raining) ride. Brace yourselves! It takes an hour to an hour and a half to navigate this muddy 22-kilometer road. Concreting of this road is underway and will hopefully be completed sometime 2017. From Sabang, Port Barton can be reached by van (Lexxus Shuttle) or pumpboat. From El Nido, Port Barton can be reached by van (Lexxus Shuttle). 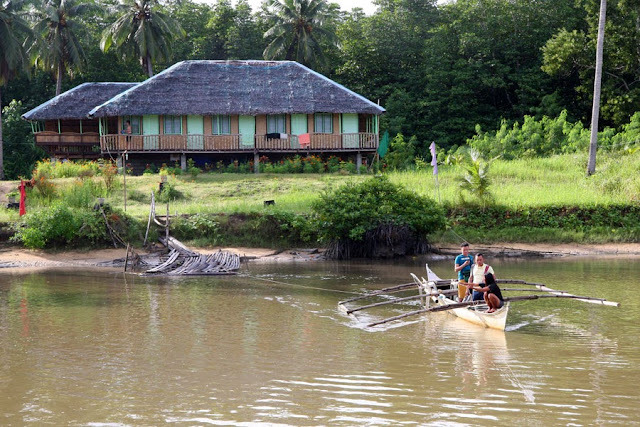 Although Port Barton is a barangay of San Vicente, it is kind of cut off from the municipality in the sense that there is no direct road between Port Barton and the Poblacion of San Vicente. Well, there is, but as of the moment, it is a small dirt road that only motorcycles dare use. pumpboat – Php 1500 for up to 4 pax, 1 hour. Sorry to disappoint you, but I don't have a list of accommodations for Port Barton. There are a lot! But I do recommend the place I stayed in: Divinagracia Cottages [Mrs Julie Divinagracia 0912 543 0983 / Ms Avon Divinagracia 0947 424 8584]. It's not beachfront, but a one–minute walk to the beach. It is that close! Divinagracia Cottages has two native cottages and two rooms in the new concrete building. 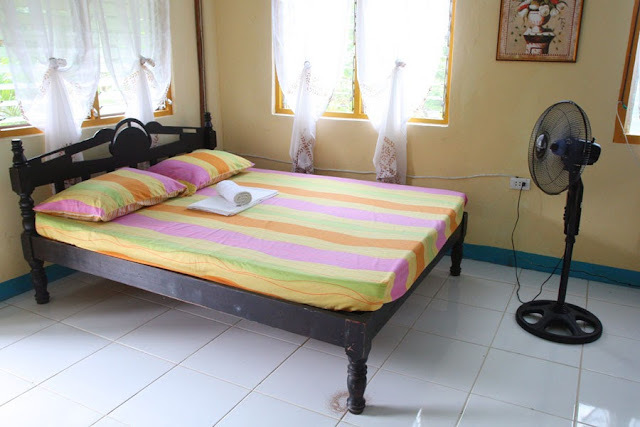 Each room is good for two persons and priced at Php 600 per room. All rooms have a fan (electricity is from 6PM to 12MN only) and an ensuite toilet and shower. Towel, toilet paper, soap, and shampoo are provided. The rooms are clean. The owners are friendly and helpful. Gacayan Restaurant is said to be the cheapest restaurant in Port Barton. The food is affordable and the serving size is quite big. They have many dishes to choose from (their menu took up the entire width of one wall!). The dishes I tried are special adobo with rice (Php 130) and shakshuka with two pieces of bread (Php 120). Miam Miam Glou Glou is a French Restaurant. The owner is a Cebuano from Pasil who married a Frenchman. They bake their own unsalted bread. I tried their savory crepe (Php 160), hummus (Php 120), and homemade bread. You're on vacation. Just relax and laze around on Port Barton's beach. But if you have itchy feet and can't stay put for too long, you can go island hopping or visit waterfalls. There are four island hopping tours, each tour visiting three spots. 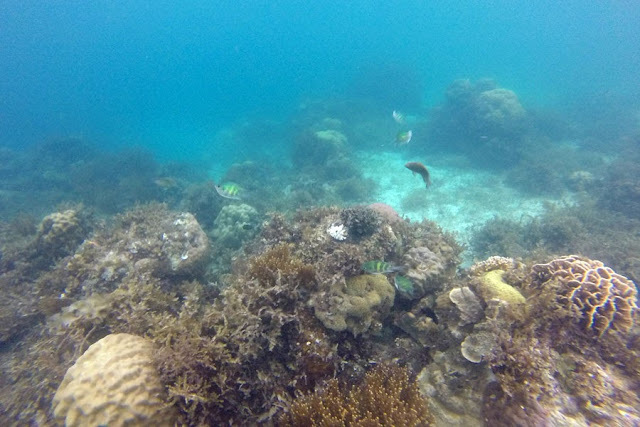 Each tour costs Php 700 per person, which includes lunch, snorkel and mask, and lifevest. The tour is from 9AM to 4PM. Solo travelers can join other groups. But if you as a solo traveler are very unfortunate to not find other groups to join, you'd have to go on a private tour which would cost Php 2500 per boat. 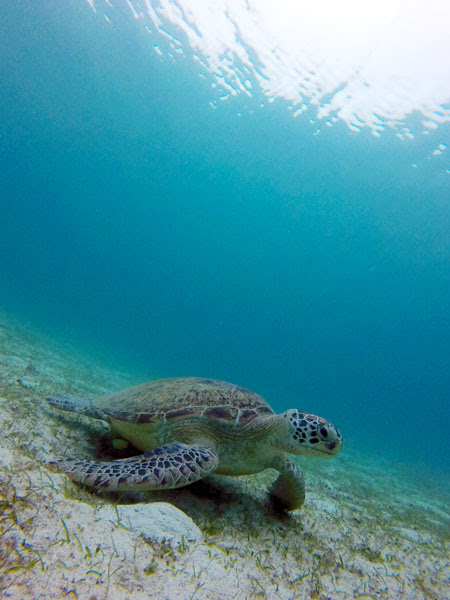 Although only three destinations are listed for each tour, we were actually taken to: Exotic Island, Paradise Island, Starfish Island, and snorkeling in Twin Reef, Ocean Reef, and an area near German Island/Double Island where there was a sea turtle. 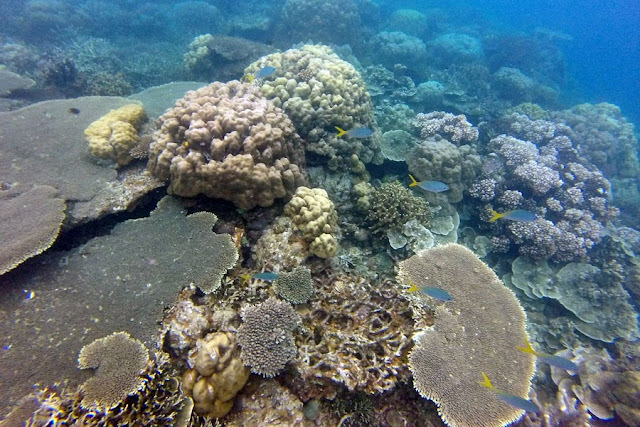 Other snorkeling spots you can visit while on an island hopping trip: Aquarium Reef, Marine Sanctuary, Wide Reef, and Fantastic Reef. In Port Barton, you can visit Pamuayan Falls and Bigaho Falls. Pamuayan Falls can be reached by hiking a 3.5-kilometer trail near Greenviews Resort. Bigaho Falls can be reached by taking a pumpboat to the village of Bigaho then a short 20-minute hike. Bigaho Falls is one of the spots visited by of one of the four island hopping tours offered in Port Barton. Heads up! Visitors are required to obtain an eco–card (Php 50) which is valid for 10 days. This can be obtained from the tourist office or through the island hopping operator. I used to travel old school: disconnected from the world, relying only on paper maps and asking strangers for directions, or just following my travel buddies around. But since I started traveling solo, I have found being connected while in another country indispensable. Not because I don't like my own company (I do! I am an introvert! ), but because I felt the need to let my family know where I was and how I was doing. I know and you all know that I am no kid (just kid-sized), but my mother still worries about me. Plus I will have all my fingers pointing at me if I get hopelessly lost. For my recent trip to Japan, I had two choices: rent a WiFi router when I arrive in Kansai airport or rent one even before my trip had begun. I chose the latter. And how? Flytpack! Flytpack is a travel WiFi router you can rent out for your trip (if you're based in the Philippines). It is currently available for the Americas, Europe, and for more than a dozen Asian countries. So why Flytpack? For the duration of my trip, renting one through Flytpack versus renting one in Japan would be Php 350 to Php 2100 cheaper (not including the Php 2800 deposit Flytpack requires of course), depending on which rental company I choose. But, hey, even with just a savings of Php 350, I could add this to my budget for one meal or something. That was the plan. And then lucky break! Flytpack sponsored the rental for the entire duration of my trip! So the budget for the rental went to my two nights accommodation! Oh yeah! Thank you very much, Flytpack! And then there's convenience. Because my flight was scheduled to arrive around 8PM, there was the possibility of unavailability of devices when I arrive (rental on the spot is subject to availability). Other concern was if my flight got delayed, rental kiosks when I arrive would already be closed: some kiosks close as early as 830PM, the rest at 1030PM. The other option, had I not found Flytpack, was to rent from one of the Japanese WiFi router rental companies online and have it delivered to the post office at the Kansai airport at an additional cost, but the post office closes at 5PM(! ), or have it delivered to the accommodation — which meant I'd have to find my way to the accommodation without relying on Google Maps. Finding Flytpack was a godsend. I expected Flytpack to deliver the router to my doorstep a day before the trip, but it was delivered four days ahead! A great relief—I did not have to sweat it out with worry had it been scheduled for delivery just a day before departure. The device comes in a little denim bag, and in the little bag are the travel router, travel adapter, charging cable, and a little manual all arranged and snug in their own little compartments. The router, though not as small as other pocket WiFi routers, is still small enough to fit in the jacket or pants pocket. On the router, important information are displayed clearly on the little screen: signal, password, number of devices connected, data used for the day. Although it is not as lightweight as other pocket WiFi routers, it has its reason for its added weight: it doubles as a powerbank. Not that I ever used it as a powerbank. But, point is, never did my Flytpack WiFi router run out of battery. It lasted longer than my body. At the end of every day, even as early as 6PM, I was already pooped and ready to crash on the bed, while the router was still about 60% full. Up to five devices can connect to the router, but I was traveling alone with only my mobile phone to connect it to so I can't say how maximizing the number of connections allowed and how maximizing the data allocation of 1GB per day would affect its battery life. Flytpack WiFi router (whose partner in Japan is Softbank) was most useful for me to access the following: Google Maps/Google My Maps, transportation apps, Google, messenger apps, and social media apps (facebook, Instagram, etc). I was connected 24/7, even in my sleep! It says on the website that the router can either be picked up from or returned to their office or delivered to and picked up from your doorstep. What it does not state explicitly on the website is that its delivery and pickup service is only offered in Metro Manila. You will find out this little fact when you reach step two in placing your order and you can't find your city in the dropdown list. BUT they do accept orders from cities other than those listed, provided the customer shoulders the shipping expenses (delivery and return). Since there is no pickup service provided for outside Metro Manila customers, I had to go to LBC to have it shipped (Flytpack sent me an email acknowledging they have received the device). Even with this little inconvenience, if and when I visit Japan again, I would still choose renting a WiFi router from Flytpack rather than when I arrive at my destination. Cost (even with the additional cost of shipping for outside Metro Manila, it still comes out cheaper than renting in Japan), convenience, and long battery life for the win! This is a guest post by Danny, a young dad and a blogger who loves writing about parenting topics over at his blog MyParentingJournal.com. Every family looks forward to enjoying a relaxing vacation in a lively destination surrounded by a cool breeze and a beautiful environment. 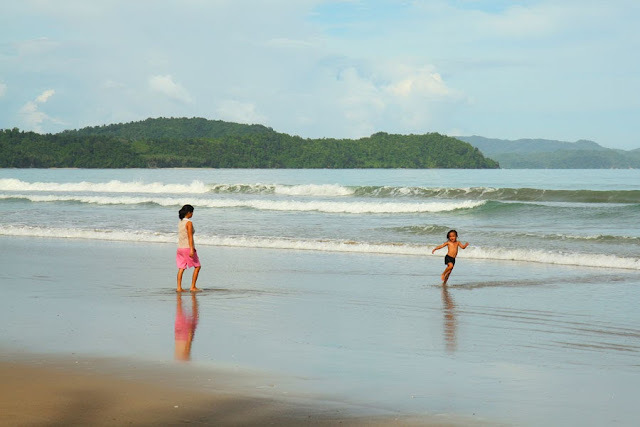 When looking for a family vacation destination, there are several factors you should consider. These include an amusement park, zoo, beaches, museums and water parks among other factors. These are some of the best places to visit in the US with your family. Hawaii is generally a great place for vacationing and there are lots of cities, beaches, and towns to visit. However, Kauai is one of the top places to visit in Hawaii for its beautiful weather, fewer crowds, and affordability. The city has magical blue waters and clear skies cast in the horizon that provide an amazing sight to see especially when sailing out in the sea. There is an abundant number of condo rentals that are family friendly and affordable too. There are lifeguarded beaches, family oriented activities, and short driving distances to and from destinations. While in Kauai with your family, go for zip-lining activities in the jungle or enjoy a relaxing bike ride along coastal paths all over the city. Grand Canyon is an incredibly inspiring site to visit with your family. While in this destination, there are lots of activities you can engage in. 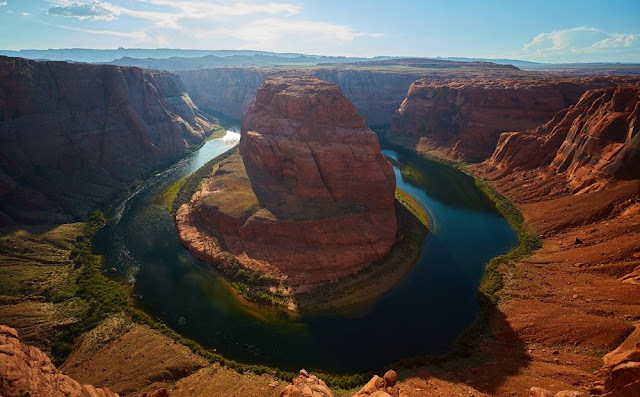 The Rim Trail in the Canyon is one of the best and most lively sights to visit and see while in the Grand Canyon. The only thing to note about visiting the Grand Canyon during summer and spring is that you need to book your accommodation in advance. This is because there are lots of people who visit this place around these months, thereby making last minute accommodation booking quite hard. Myrtle Beach is an impressive 60-mile beach stretch characterized by family-friendly vacation spots, and budget-friendly rentals. 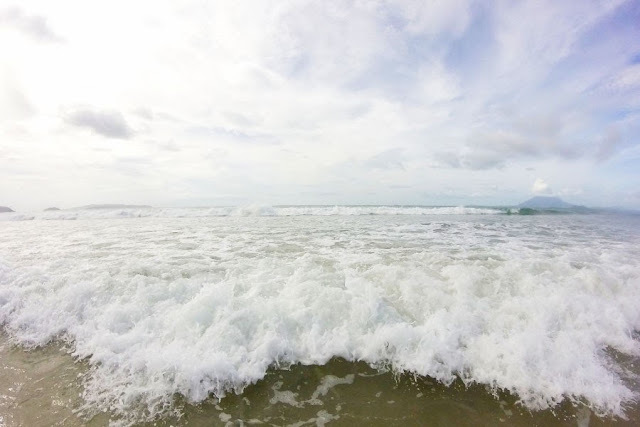 The beach prides itself in having amazing bodysurfing waters, a carnival-like atmosphere, and a mile-long promenade that you can walk your kids or pets along. There are amazing waterslides, water parks, and amusement parks. Just like the Grand Canyon, it is good to plan ahead for your visit as during summer, there are thousands of people who visit the beach around this time. If you have ever wished to take your family to the power seat of the U.S, then Washington D.C. is the best place to visit for a family vacation. The best thing about Washington is that most museums and top attraction sites like the White House are free to visit. Some of the popular monuments that you can visit while in D.C. for a family vacation include the Lincoln Memorial, the National (World War II) Memorial, and other monuments. If you want to save on your accommodation costs while in the D.C, you can book early or opt for alternative accommodation in Arlington, Virginia. Outer Banks in North Carolina are yet other beautiful destinations to visit as a family. Found along the state’s shores, these banks draw a lot of families from all over the country as well as across the globe. While in North Carolina, make sure you visit other attraction sites like Wright Brothers (National) Memorial. You can bring your pets along too and book a pet-friendly accommodation facility to stay in during your vacation. Honolulu is famed for its beautiful and child-friendly beaches that are not only attractive to children but adults as well. There are lots of activities that children can engage in in Honolulu including swimming with dolphins, snorkeling, and visiting the Hawaiian Adventure Park. The best thing about Honolulu is that there are very many hotels set along the shores and in close proximity to key attraction sites. This negates the need for seeking transport means while in Honolulu for a family vacation. Most of the attraction sites and amazing sights in this destination are known for their timeless appeal. There is a slew of theme parks, adventure parks, and other children-friendly sites spread all over the island. Generally, when looking for the best place to visit with your family, you need to look at more than what the kids will enjoy. You should also consider your interests as well as those of your spouse too. In addition to this, you should also consider the amount of money you are willing to spend on the vacation. This will make it possible for you to cut cost where necessary and focus on having an enjoyable vacation. Vinegar. One, it's great for dipping your usual beach meal of grilled fish and/or grilled pork in (plus soy sauce). Two, to kill the sting if you become a lucky jellyfish victim. Surf (laundry) powder mixed in water. To clean your mask/goggles. Also good for jellyfish stings, so the boatman told me. And yes, he specifically said to use Surf brand.